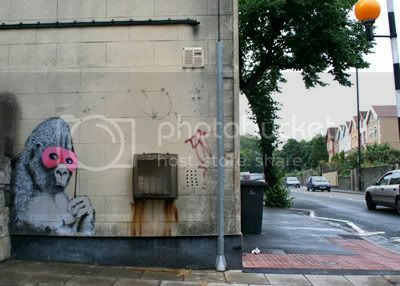 Banksy Gorilla in Fishponds Road, Eastville, Bristol – Painted Over!!! I like the idea that a piece of graffiti can be restored as the ghost of its former self, kind of there and kind of not really, fantastic attempt and perhaps a first of it’s kind. I wondered if it could be varnished over as the first piece of graffiti ever to be renovated for posterity and cultural wealth. Well done Mr Saeed Ahmed of the New Cultural Centre in Fishponds Road, I salute you with many sincere thanks for giving it a bash, the gesture is much appreciated by me. Looks a bit sad now! I also wondered if the eyes were actually Banksy’s looking out from under the mask? If you click the photo (larger image) you should be able to take a closer look. Also, if you look through a few Banksy works you don’t come across too many self portraits, I wondered if this is one of them? Anyway living here is not the best place in Bristol and it can be grim to say the least but the cultural scene is set. On pretty much a daily basis I walk past this iconic Banksy Gorilla to get to one of my local shops, a familiar landmark which always raised a smile on my face – Thank Banksy for small mercies! And to top it all it was destroyed on the same day as the Wow Gorilla project was launched in Bristol – Time to move out I here you shouting – I hear you! Banksy: If you get a chance when your down visiting your Mum I wondered if you could do another one for us… Big Thanks in advance!